You are looking for affordable and reliable car service directly between the airport and most major hotels in Chicago and Chicago suburbs. Our limousine company is based in Chicago and we offer you airport limousine transportation at very reasonable rates. We are not trying to be the cheapest, we are being a company of choice for hundreds of Chicago based companies due to our reliability, dependability, quality of service and a wide selection of cars to cater to different needs and tastes. In business since 2000 our limousines service Chicago and Chicago suburbs, entire state of Illinois as well as destinations in adjacent states of Iowa, Indiana, Michigan, Wisconsin, Kentucky, Minnesota, Missouri and Ohio. 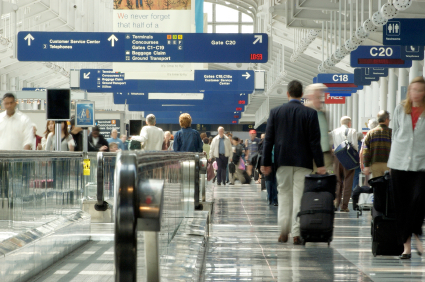 Major Chicago airports we provide car service to include O’Hare International airport (ORD) and Midway International airport (MDW). We also offer competitive and affordable rates on limo rental to and from Chicago Executive Airport in Wheeling (formerly Palwaukee Municipal Airport), Gary/Chicago International Airport (GYY) as well as regional airports like DuPage Airport (DPA) in West Chicago, Aurora Municipal Airport (AUZ), Schaumburg Regional Airport (06C) and many others. Our friendly reservation desk is open 24 hours a day to place a reservation, inquire the status of your limo, confirm an order or answer your questions. We will be glad to provide you with a custom limo quote if you prefer talking to a live person instead of placing order thru our online reservation system. Our dispatchers track your flight and dispatch your limousine accordingly to monitor for late or early arrival. We stay in continuous contact with the chauffeurs to provide them with latest details on flight arrival as well as directions and traffic details. Our state of the art booking system presents you with the final rate you are going to pay before you enter your credit card details. We make sure you feel confident that your expectations will be met before you pull our your wallet. We do not play games of hidden charges, surcharges, additional fees like many competitors. We take pride in our commitment to you of no hidden fees for your limo service. Placing limo order online using our reservation system helps you specify details, without pressure of a phone call and helps you get a special limo rate to your destination. You can track your reservations, print receipts, receive email confirmations and it eliminates a need to pick up the phone. Not a bit sweat of going up and down the stairs required on taking the trains, but just sit back and relax to fully enjoy the smoothest cruising with us. Travel with class in our Hummer limousine, Navigator limousine, Excursion limousine, Escalade limousine, limo van, Chicago charter bus, limo bus, black car rental, airport shuttle, airport transportation, motor coach, trolley, charter bus, SUV limo or best SUV stretch.